Buffalo Wild Wings CEOÂ Sally Smith said the game is “a premium craft beer that is designed to go perfectly with our flavorful wings while watching a game.â€ Smith also noted that the restaurant brand has been looking for ways to increase their beer margins for some time now, but found it challenging due to cost restrictions from brewers and distributors. Buffalo Wild Wings also announced that it’s changing its pricing for wings. It will now sell wings according to weight instead of quantity. Wings will now be available in “snacks, small, medium and largeâ€ serving sizes. “Our new servings will allow us to serve a consistent portion of chicken to our guests when the size of wings fluctuates,” Smith said. The company buys wings by the pound and has sold them by the piece, but chicken growers are producing bigger birds with bigger wings, leaving the brand with fewer wings per pound. 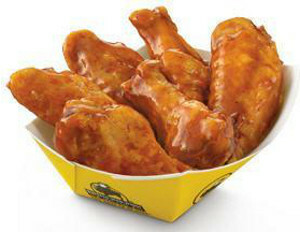 Wild Wings has been testing new portioning in about 40 markets. The company will begin implementing the new portioning at all of its restaurants in July, and plans to have it completed by the start of football season.